Rajasthan surely is one of the best states in India, which is known for its wonderful culture, colorful bazaars, architectural marvels and much more. Archaeological Tour of Rajasthan, spanning in a duration of 23 nights and 24 days, offers you chance to explore some off-beat destinations of Rajasthan, including some of the most popular ones. This itinerary also includes the very-popular Golden Triangle Tour destinations of India- Delhi, Jaipur and Agra. During the tour, you indulge in a number of memorable experiences including sightseeing of forts, palaces and other monuments, shopping, special meals, attending folk music and dance performances, world heritage sites like Taj Mahal, Qutub Minar, Jantar Mantar and Fatehpur Sikir etc. On arriving at Delhi International Airport, meet our tour representative who helps you with an assisted transfer to the hotel. After completing the check-in, the representative briefs you about the tour program. Now, you are free to explore the surroundings on your own. The capital city of India, Delhi is one of the fastest growing cities that blends a bold present with a rich historic past. Built on the ruins of 7 ancient cities, Delhi comprises of Old Delhi and New Delhi, and is dotted with several tourist attractions that were commissioned by its rulers in the due course of its recorded history. The city is also quite popular for its lip-smacking street food. After breakfast, the day is scheduled for exploring Delhi. The list of attractions of Old Delhi that you visit today include the colossal Red Fort- a red sandstone gem; Rajghat- Memorial of Mahatma Gandhi, and Jama Masjid- constructed by Mughal Emperor Shah Jahan, it is India's largest mosque. Hop into a rickshaw and enjoy a ride through the bustling streets of Chandani Chowk. Next partake in the sightseeing tour of New Delhi which begins from Rashtrapati Bhawan, the imperial residence of the British viceroys,and India Gate- 42 m high which is a war memorial dedicated to soldiers who martyred during the Afghan war. Followed by a visit to Laxmi Narayan Temple- dedicated to Goddess Laxmi and Lord Vishnu, World Heritage Site of Humayun's Tomb- constructed by Humayun's son Akbar in 1569-70. 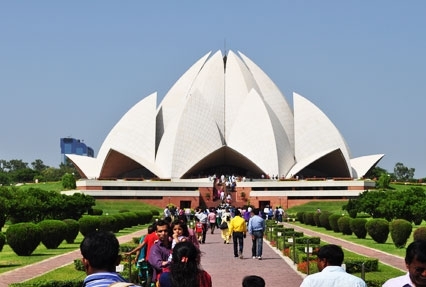 Lotus temple- a lotus- shaped Bhai Temple; UNESCO world heritage site of Qutub Minar - constructed by Qutub-ud-din Aibak of the Slave Dynasty are some other attractions to be covered. The evening is scheduled for light and sound show at Red fort – depicting the rich history of India. On day 3, have your breakfast and check-out from the hotel. Now begin driving to Jaipur. 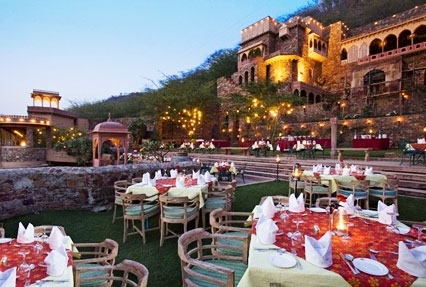 On the way, halt at the luxurious Neemrana Fort, the first heritage hotels of India. Once the residence of the descendants of Prithvi Raj Chauhan, today the place offers memorable accommodation and other experiences. You can stop here for lunch. Now, continue to Jaipur. On reaching, check-in at the hotel. Relax for some time now. Have an evening visit to the stunning Birla temple or Laxmi Narayan temple- Made from white marble, it looks beautiful at night when it is well-lit. Savor Dinner at Chokhi Dhani. A village-like 5-star resort offering several attractions like puppet show, camel ride, live music, games, henna applying, several village games, folk music and dance performance, Rajasthani food and more. The day, after breakfast, is for the city tour of Jaipur, fondly known as the 'Pink City'. The first visit of the day is to the massive Amber fort or Amer fort, located 11 km away from the city. Enjoy an elephant ride up to the entry gate of the fort that is placed on a hilltop. Back in the city in the afternoon, and explore the beautiful City Palace- a wonderful blend of Mughal and Rajasthani styles of architecture. Next visit is to the Central, also known as Albert Hall Museum- built in 1887, it houses Indian art, jewelry, arms, furniture, artifacts etc. After this, head towards the World Heritage Site of Jantar Mantar- out of 5 astronomical observatories built by Sawai Jai Singh, it is the largest one. Next is the beautiful pink-colored Hawa Mahal with its 953 jharokhas (small window) from which the royal ladies could the city's hustle-bustle. In the evening visit the colorful local bazaars of Jaipur filled with some amazing stuff like handicrafts, textiles, precious and semi-precious gems and more. On the 5th day, have breakfast, and hit the road to Nawalgarh. On the way, halt at Samode. Lying within walls, Samode is a caravan city that has a beautiful castle, called Samode Palace, which you visit to day. The most attractive structure here is the Hall of Mirrors or the Sheesh Mahal. In the pre-evening hours, hop onto ma camel cart for exploring the mighty Samode Fort and the semi-desert Samode village to have a look into the villagers' culture. Thereafter, continue towards Nawalgarh, one of Rajasthan's historical city. Upon arrival, check-into the hotel. The evening is at leisure. You can explore this tiny town of the Shekhawati region that is dotted with havelis and forts, adorning frescoes. These stunning mansions showcase the affluent Marwari era in then19th century. As you cross an arched gateway painted with Lord Krishna and his cows, you enter the local bazaar. Observe the rich culture and the wonderful architecture of the state here. Chokhani Haveli, Anandilal Poddar Haveli, Aath Haveli complex, and Bansidhar Bhagat Haveli are worth-visiting. Evening is for attending a folk music and dance performance in the hotel's courtyard. On day 6, post breakfast, enjoy a city tour of the erstwhile royal Nawalgarh town. The first visit of the day is to huge, opulent beautifully painted havelis of Shekhawati region. One of the most popular one is Roop Niwas Palace, located just a kilometer away from Nawalgarh Fort. An amazing architecture, this haveli, still holds its old charm. The splendid fountains and the well-maintained gardens are the highlight. Back to the hotel for completing the check-out formalities. Later, hit the road to Bikaner. Evening arrival and completion of the check-in formalities. If time and energy permit, you can explore the surroundings. Overnight at the hotel in Bikaner. After morning breakfast, check-out and move to Jaisalmer, by road. On the way, halt at the hunting lodge of Maharaja of Bikaner- Gajner Palace. Later, you visit the serene Gajner Lake. Next is an exciting wildlife safari inside the popular Gajner Wildlife Sanctuary where you can spot animals like black bugs, wild boars, chinkaras and blue bulls. This sanctuary is also quite known for offering wonderful bird watching experiences. It also has the only Camel breeding farm in Asia Thereafter, continue your road journey to The Golden City of Jaisalmer. Upon reaching, check into the hotel. In the evening, you can visit the local bazaar of Jaisalmer for shopping of souvenirs. Post breakfast on the 8th day of the tour, embark on city tour of Jaisalmer including the prime attractions like the mighty Jaisalmer Fort – comprising of 99 bastions, it is positioned on the highest point of the Trikuta hill. Within the premises of the fort, there are some stunning architectures like Megh Durbar and a number of temples. Two mansions worth-mentioning are Patwon-Ki-Haveli and Salim Singh-Ki-Haveli, boasting of breathtaking latticework and delicate stone carvings. Have your breakfast, fulfill the check-out and start your road journey to Khimsar, an erstwhile kingdom. On the way, visit the ancient Osian village and its ruined yet wonderful remains. An oasis in the desert, Osian has an old township, comprising of tiny villages, desert patched and undulant terrain. Explore the 15 beautifully-sculpted Brahmanical and Jain temples. Sun temple (Surya temple), Sachiya Mata temple, Lord Mahavira temple and Kali temple are most outstanding. Continue to Khimsar. On arrival, check-in at the hotel. Evening is scheduled for horse riding, camel safari, and special folk music and dance performances. Visit the villages of Bishnoi community for observing their distinct desert life. After sightseeing, explore the countryside town of Nagaur. On the 10th day, after breakfast, begin your road journey to Manvar. Located in Shergarh Region of Thar Desert, this place has the area's highest sand dunes. Arrive at the very luxurious Manvar Resort and complete the check-in. Later on, hop onto a camel's back for desert safari where you enjoy a rude till the Manvar Camp Site. Enjoy sunset and lovely views of sand dunes. You also have an option of jeep safari to pick from. The other highlights of the day includes exploring Dhani- a desert dwelling; visiting the carpenters, potters cobblers and metal smiths for their amazing work; seeing the Virgin sand dunes, attending folk music and dance performance under open sky, and spotting the desert's wildlife including nilgai, Indian gazelle, desert fox and peacocks. After breakfast, hit the road to Rohet. Around 40 km from Jodhour, this place is an ideal mix of serenity and excitement. After reaching at the hotel, relax for a while and then embark on a village tour to partake in traditional folk ceremonies. Notice the artisans busy in their work, making handicrafts, leather things and pottery. Along with being home to 3 antelope species- black-buck, chinkara and blue bull, Rohet is quite popular for its bird watching experiences (domestic as well as migratory birds). Spend the evening doing camel safari. Have breakfast and get all set for a day trip to the princely state of Rathors- Jodhpur. As you reach, continue with sightseeing including the popular attractions of Jodhpur, including the massive Mehrangarh Fort. Covering an area of 5 sq km, this fort has 7 gates and is placed at an altitude of 125 m. Next in line is Jaswant Thada- built in the memory of Maharaja Jaswant Singh, it is a beautiful white- marble structure. Now, enjoy a visit to the stunning Umain Bhawan Palace, commissioned by Umaid Singh. Constructed in a span of 16 years, this palace was built with an aim to provide employment to the famine-struck people of the area. While the royal family stays here in one part, the other has been turns into a museum. Thereafter, have an excursion to the Bishnoi village, inhabited by the Bishnoi tribe, known to be protectors of animals. Have a look at their lifestyle and their traditional attire. Next, you visit the artisans making handicrafts, pottery, shoes and so on. If you spot chinkaras, peacock etc. on the way, do not forget to click a photograph. Back to Rohetgarh for overnight stay. After you have your breakfast on day 13, check-out and begin driving for the only hill station of Rajasthan- Mount Abu. Check-in is followed by some relaxation time. Placed at an altitude of 1220 m above the sea level, this lovely hill town has stunning temples, amazing weather and wonderful views. Have an evening visit to Nakki Lake – known to have a mythological connection, this lake has tranquil surroundings and Sunset point- offers memorable sunset views. Post breakfast, day 14 is scheduled for sightseeing of Mount Abu, including its natural attraction and the very popular Dilwara temples, a collection of 5 Jain temples. Erected in the starting of the 11th century, these temples have stunning carvings and stone work. 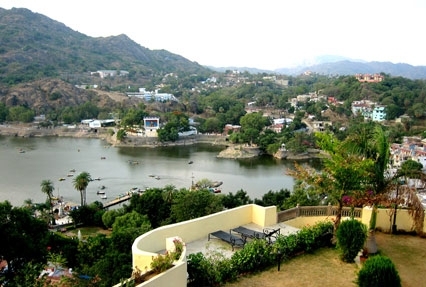 The attractions of Mount Abu that you visit today include Gaumukh temple – the dwelling of Sage Vashishtha lived here with his wife, it is dedicated to wish fulfilling cow; Vimala Vasahi- one of the oldest and finest Dilwara temples; Bhram kumaris Temple- a socio-spiritual and educational institution, and Achalgarh Fort - placed 11 km northwards of the main town, this medieval fort was erected by Maharana Kumbha in 1452 CE. Start driving to Udaipur today, after relishing breakfast. On the way, take a break to explore the architectural gems of Ranakpur Jain temples - a collection of 12th century places of worship, famed for their intricately-carved white marble. Made from marbles, each from the total of 108 pillars has a distinct carving, from the other. Later on, have lunch at a restaurant / hotel in Ranakpur. Proceed to Udaipur. Check-in on arrival. The evening is scheduled for a memorable boat ride in the placid waters of Lake Pichola. One of the most romantic places in India, Udaipur is the city of lakes, Aravalis and several other wonders like gardens, palaces and, temples. Today, after breakfast, embark on a city tour of Udaipur. The first visit of the day is to the mesmerizing City Palace that is placed on the banks of Lake Pichola. The construction of the palace was started in 1559 by Maharana Udai Singh II and additions were made by several of his successors. The construction was completed in 400 years. Some of the structures worth-mentioning are Jagdish Temple, Palace Museum, and Durbar Hall. Later on, you explore Sahelion-Ki- Bari, a beautiful garden adorned with marble elephants, fountains, kiosks etc. that also has a small museum. Next in line is Lok Kala Mandal that comprises of several artefacts, puppets, dolls, masks, ornaments, paintings, folk dresses and more. Thereafter, witness the village art and craft at the very popular Shilpgram, an open-air gallery and theatre. Now visit the very popular white-marbled Eklingji and Nagda Temples, with 2-storied porch on the banks of Bageela Lake. On day 17, have your breakfast and hit the road towards the serene city of Dungarpur. As you reach, complete the check-in formalities. After settling in, Dungarpur city tour begins. The city has been blessed with natural scenery which is clubbed with some wonderful architectural marvels. 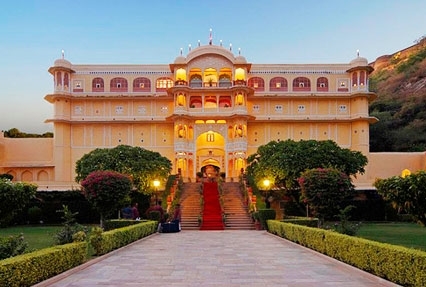 Some of the prime attractions that you visit today include Juna Mahal – a former royal residence belonging to the 13th century, it has richly decorated walls as well as ceilings and Udai Bilas Palace- now turned into a heritage hotel, this 19th century Rajput-Style palace lies on the banks of Gaibsagar Lake. The city also includes some other monuments too. Do notice the stunning paintings, frescos, glass inlays and mirror work. The evening is at leisure. You can indulge in the activities of your interest. After breakfast, check- out and start driving to Deogarh, 80 km north-east of Udaipur. Placed at an altitude of 2100 feet above the sea level, this place is cooler than the other cities of Rajasthan. Upon reaching, check-in at one of the heritage hotels of Deogarh. Thereafter, the city tour of Deogarh starts. The first visit is to Deogarh Mahal- a 17th century palace, it is now a heritage hotel. The palace is quite close to few lakes where one can spot a number of migratory birds. The palace also has an impressive collection of miniature paintings. Relish traditional delicacies of traditional Mewari cuisine. The evening is scheduled for folk music and dance performance. On the 19th day, have your breakfast. Check- out is followed by a road journey to village Pachewar. On the way, halt at Ajmer to pay your homage to the revered Shrine of Khwaja Moinuddin Chisti. Next you make a stoppage the holy town of Pushkar, also known for the world's biggest cattle fair organized every year. Famed as an ancient city, it has more than 500 temples and several ghats. The temples of the city are not only places of worship but also are architectural wonders. The place has been blessed with serene ambiance. Here, you visit the Lord Brahma temple (the only temples of the Lord in the country), surrounded by the holy Pushkar Lake. The devotees take dip into the holy waters of the lake and offer prayers. Later, visit the site of Pushkar Fair (opposite the Pushkar Lake). Later on, visit and shop at the colorful market of Pushkar. Thereafter, continue to Pachewar. Arrival and check-in. If time and energy permits, you can explore the place on your own including the Pachewar Fort with huge balconies and impressive gates. Day 20, after breakfast is for sightseeing in Pachewar including the wonderful royal cenotaphs on the banks of Pumpa Sagar Lake and the old temples. Later, you can visit the village to observe the life of the locals. Watch the artisans and craftsmen indulged with making blue pottery, carpets, terra-cotta, and colorful tie and dye. You can also see the nomadic Gadia- Luhars or the iron-smiths doing their work. Back to the hotel for check out. Later on, start driving to the very well-known Ranthambhore National Park. One of the finest tiger reserves in India, it was also the former hunting grounds of the royal family of the region. On arrival, check into the hotel. The evening is free for you to indulge in leisure activities. This day, after breakfast, is going to be an exciting one with wildlife safaris inside the Ranthambore- the largest wildlife reserve in northern region of India. The wildlife safaris are conducted in the morning and in the evening. Along with the big cats, the national park is also home to a vast variety of animals such as chinkara, sloth bear, sambar, common langur and more. 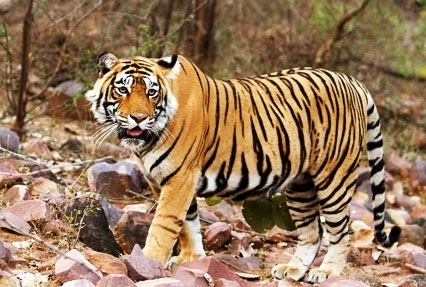 The park also has as many as 272 avifauna species, and bird watching is one of the best things to do in Ranthambore. Later on, you visit the Ranthambore fort and the popular Ganesh Temple, made near the entrance of the now slightly-dilapidated fort. Back to the hotel for some rest. Then, in the evening, if you want you can again opt for a wildlife fame inside the tiger reserve accompanied by naturalist guide. Today, once you have your breakfast, check-out and start your road journey to the Mughal City of Agra. On the way, make a stopover at the UNESCO World Heritage Site of Fatehpur Sikri. Founded by Mughal Emperor Akbar as his capital city but was later abandoned due to shortage of water. The ruler built this red sandstone city in the honor of Saint Salim Chisti with whose blessings the ruler bore sons. 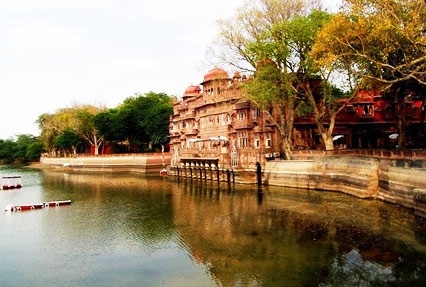 This place has wonderful structures that are worth- visiting such as Diwan-i-Khas, Diwan-i-Am, Panch Mahal, Tomb of Salim Chisti, Buland Darwaza, Jama Masjid, Anarkali Darwaza and so on. After this, continue your journey to Agra. On arrival, check-in at the hotel. After some rest, in the evening, you have the option of visiting the local markets of Agra to collect souvenirs. The day starts early. Have an early morning visit to the perennially beautiful Taj Mahal - one of the Seven Wonders of the World, which is also a World Heritage Site. This monument glistens stunningly in the glory of the rising sun. This white-marble mausoleum was built by Emperor Shah Jahan in the memory of his beloved wife Mumtaz Mahal. Continue the city tour of Agra by moving towards the massive Agra Fort, commissioned in 1565 AD by Emperor Akbar. While the red sandstone part of the fort are by Akbar, the marble structures are by Shah Jahan. Explore some wonderful structures like Pearl Mosque, Sheesh Mahal, Nagina Masjid, Diwan-i-Am, Diwan-i-Khas, Jahangir Mahal, Macchhi Bhawan, Meena Nazar, Musamman Burj and so on. Next, you visit the Tomb of Itamad-ud-Daula, constructed by Empress Noorjehan in memory of her father. Return to the hotel for check- out. Start your journey for Delhi. On the way, make a halt to visit the Sikandra that has Tomb of Mughal Emperor Akbar. Proceed to Delhi. On arrival, check-in at the hotel. Post breakfast, the morning of the last day of the tour is free for leisure activities. Later, get transferred to the airport to board the flight for your onward destination.